"At about 9 o'clock on the evening of September 8th 1727, fire broke out in a barn, in which a great number of persons were met together to see a puppet show. In the barn were a great many loads of new light straw. The barn was thatched with straw which was very dry, and the inner roof was covered with old dry cobwebs, so that the fire like lightening flew around the barn in an instant. There was but one small door, which was close nailed up, and could not easily be broken down. When it was opened, the passage was so narrow and everybody so impatient to escape that the door was presently blocked up, and most of those that did escape, which was but very few, were forced to crawl over the bodies of those that lay in a heap by the door." "Seventy six perished immediately and two more died of their wounds within two days." "The fire was occasioned by the negligence of a servant who set a candle and lanthorne in or near a heap of straw which lay in the barn. The servant's name was Richard Whittaker, from the parish of Hadstock in Essex, who was tried for the fact at an assize held in Cambridge on 27 March 1728 but was acquitted." 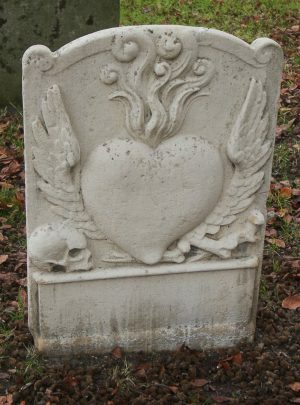 "Deathbed Confession; a report reveals that an old man who died a few days ago at a village near Newmarket who just before his death seemed very unhappy. He said he had a burden to disclose. 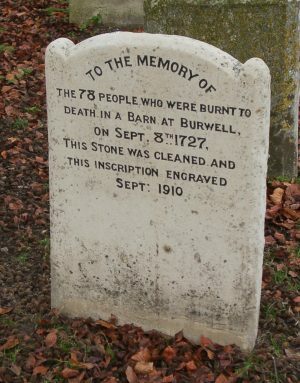 He then confessed that he had set fire to the barn at Burwell on Sept. 8th 1727, when no less than eighty persons unhappily lost their lives. He said he was an Ostler at the time, and that having an antipathy to the puppet showman, was the cause of his committing that diabolical action attended with such dreadful consequences." No name was published in the article, and a short note in the "Fenland Notes and Queries" supposes that Richard Whittaker was wrongly acquitted, but suggests delirium as he was nearing death.